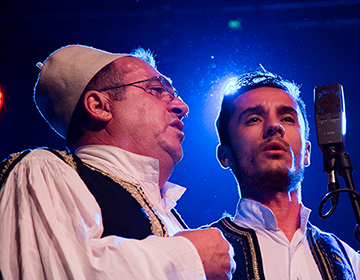 Otherworldly, complex and trance-inducing sounds manifested by the power of the human voice, carrying the emotional weight of centuries of pride, poverty and oppression; polyphonic vocal music is a living tradition in Albania and in 2005 was proclaimed a Masterpiece of the Intangible Heritage of Humanity by UNESCO. 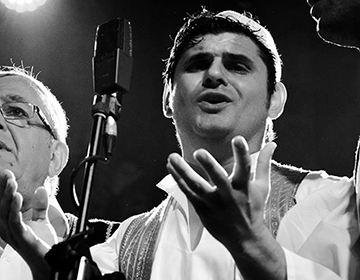 Hysni (Niko) Zela, often superguest of the choir, is the most prominent representative of the distinctive styles of southern Albania, where the drone can be sung either continuously or rhythmically against the interlacing melodies and occasional wild or mournful cries of the other voices to weave a haunting web of shape-shifting, dissonant beauty. 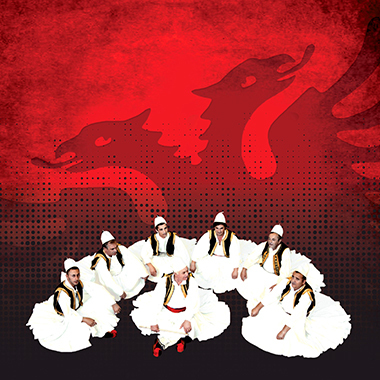 Niko has been performing for over 40 years, touring internationally as a member of the Albanian National Ensemble, with his own ensemble and as a guest singer with the Fanfara Tirana brass band. He is awarded by the Albanian Presidency with the most ambitious award for any musician, "Master of Arts". 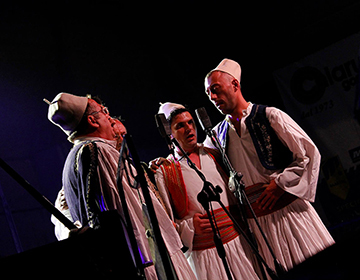 Folk Iso-Polyphony is a form of traditional music of Albania. Most of the villages and towns have an iso-polyphony band. “Iso” refers to the drone accompanying the singing. Rendered principally by male singers, it is performed during social events (weddings, harvest feast, funerals, religious celebrations, festivals, etc.). It is practised in the south of Albania and is typical for two large areas: Toskëria and Labëria. If both Tosk and Lab polyphonic songs include ballads, historic songs, lyrical songs, etc, they perform the drone differently. The Tosks perform the drone continuously and sung on the syllable “e”, while the Labs sometimes sing the drone as a rhythmic tone. Traditionally, iso-polyphony in the southern part of Albania has been transmitted form parents to children, but large-scale migrations due to economic hardship have caused the discontinuation of this mode of transmission. The Albanian folk Iso-polyphony was proclaimed in 2005, a Masterpiece of the Oral and Intangible Heritage of Humanity. Most of the sigers are part of the Albanian National Ansamble. HUFFINGTON POST by Michal Shapiro (USA) - Although there is great dissent and discussion amongst those of us who attend WOMEX, (the European World Music Expo) about its inclusion of so many hybrids and pop manifestations, we always know that there will be a helping of something starkly ethnic that will please the most demanding purist ear. This time it was Hysni (Niko) Zela and the Albanian Iso-Polyphonic Choir. The polyphony of Albania is one of the most hair raising and hauntingly gorgeous sounds made by the human voice. Strong words, but I stand behind them. I first heard this kind of music back in 1995 when I was putting together a compilation of music from formerly Soviet “satellite” nations. It sent me roving through what for me turned out to be Terra Incognita on multiple levels. I remember trying to get recordings from the State owned radio station in Tirana and coming up against a surprising language barrier; my English and French were of no use—either I had to speak Albanian or I had to speak ….Italian. Plus there were several layers of Albanian song, depending on the region. But at last I found a recording of a polyphonic group singing “The Legend of the Walled in Woman” and I knew I had found something precious and important. It literally sent shivers down my spine, and that does not happen often. FROOTS (UK) by Nick Hoobs - Albanian polyphony has particular harmonic characteristics and a certain warbling in the lead voice which makes it quite distinct from other European and Caucasian polyphonic traditions, and it's lovely. This snappily-named group of seven are dressed like folkloric imams (that's not a criticism) and sing (in Albanian and Italian) like, for want of a better comparison, angels. They're completely purist, no discernible modernisms. When they sing at their quietest and most intricately delicate, even my breathing seems an intrusion. Exquisite. JAZZITALIA (IT) by	Vincenzo	Fugaldi - Un quintetto vocale che ha dato un saggio del fascino e della complessità della polifonia albanese, una delle più suggestive dell'area mediterranea insieme a quelle sarda e corsa.